Back to New York City for another installment of ESR Around the World. 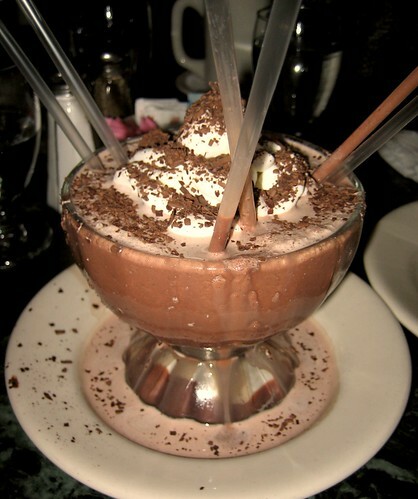 Serendipity 3, opened in 1954 and located in the Upper East Side of Manhattan, is a famous dessert restaurant. 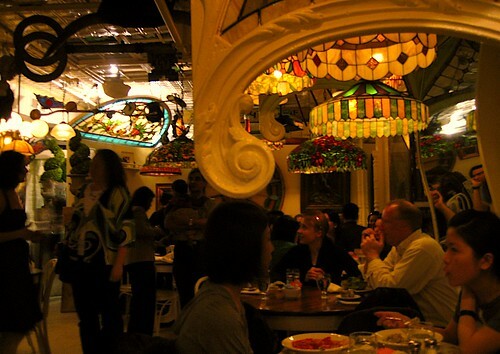 Serendipity 3, however, has been infamous as of late since it was shut down (temporarily) last year by health inspectors on the grounds of rodent and pest infestation. Eww! Help avoid running into that here by checking out the list of Vancouver restaurant closures. Nope! No rat here! 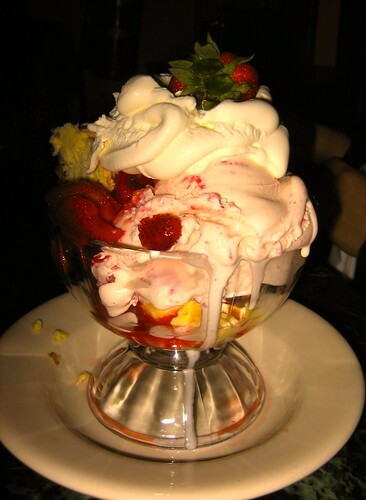 Just a ginormous and seemingly endless bowl of fresh strawberry ice cream, whipped cream, big plump strawberries, and huge chunks of authentic New York cheesecake. I’M STILL PRETTY HYPER FROM THE INCREDIBLE AMOUNT OF SUGAR IN THIS SUNDAE. Next up, their famous Frrrozen Hot Chocolate ($8.50). Would I make a trip to New York City just for this drink? Nope. But was it good? Yup. I was having a difficult time imagining exactly what a frozen hot chocolate would taste like. How can something be frozen and hot at the same time? Would it not just be… cold chocolate milk? Thankfully, it wasn’t. It tasted like an intense chocolate smoothy, saturated with tasty chocolate shavings, and topped with whipped cream. $8.50 might seem like a lot to pay for a cup of hot chocolate, but this cup is huge and could easily be shared between 3 or 4 friends. The environment is pretty cool, especially if you’re into Bohemian style. The Tiffany glass lampshades were certainly whimsical and fit in with the whole “Serendipity” theme I suppose. Most importanly, I did not see a single cockroach or rat. Then again, I did not see a single Marilyn Monroe either. Introducing Eat, Snap, Repeat Around the World! You didn’t think we would stop blogging just because we were on vacation did you? I feel that meals make up some of the most memorable parts of a vacation: they’re where you spend a large portion of your vacation budget, where you meet and socialize with old friends, and where you get a taste of the local culture. To me, this is what Eat, Snap, Repeat is all about. We’re gonna kick off ESR Around the World with New York City. GREAT SUCCESS! 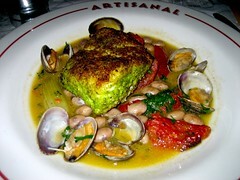 First meal: Artisanal Fromagerie Bistro & Wine Bar, located on 2 Park Avenue in Manhattan. Boy was I hungry (the frozen muffin from Bellingham International Airport and Whooper from Salt Lake City International Airport did not cut it). Walking into Artisanal, I instantly felt the New York City vibe. It was packed. It was loud. Now, restaurants in Vancouver can get pretty busy (especially the ones in Richmond), but this felt different. The patrons were well-dressed and boisterous: business men and women letting it all out after a day working at their Manhattan offices perhaps? Distracted by the interesting crowd only momentarily, my growling stomach quickly focused my attention back on the menu. Because Artisanal is famous for its great selection of cheeses (over 250 different kinds! 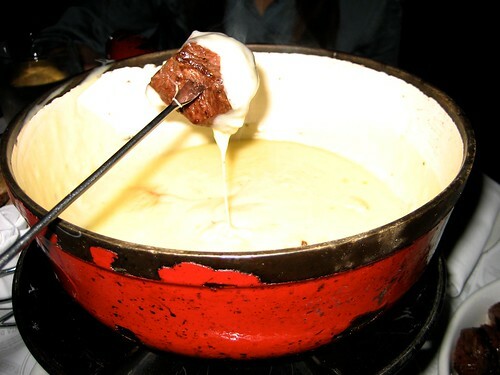 ), we started off by sharing their Artisanal Blend cheese fondue ($24). I’m not exactly sure what the fondue consists of, but it was certainly memorable; I tasted a blend of extremely sharp cheeses, garlic, and liberal amounts of alcohol. Cubes of bread, apples ($3.50), and beef tips ($10.50) coated in this gooey concoction came to life. Next up, an entree of Chatham Cod ($26.50). Not bad, but not as memorable as the stinky fondue. For my first NYC dessert, what else could I get than a slice of cheesecake? Forget New York style, this is the real deal. 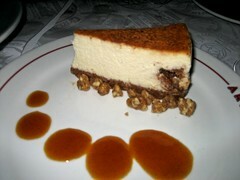 We shared the Artisanal Cheesecake, with Pecan Praline & Caramel Sauce ($10.50) – simply amazing. Words cannot describe. All in all, not a bad way to kick off my mini vacation in New York City. Stay tuned for more posts from the Big Apple.